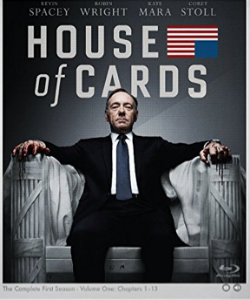 Recently we got a chance to find English TV Serial House Of Cards on Amazon India. We found the concept of the series interesting and decided to give it a shot. We purchase the DVD set, and we found that it was right decision to go for it. If political drama is your cup of tea, you will enjoy watching it. And if you are not sure whether you will like it or not, as it might be a new genre for you; go through our reviews and then follow your instincts. 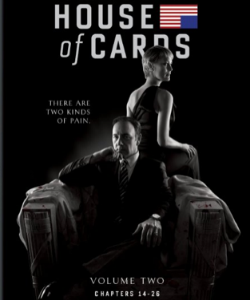 Beau Willimon liked House Of Cards a mini-series aired on BBC and he thought to adapt the same in the context of USA. (It is worth to note that the BBC’s mini-series is based on the novel of the same name by author Michael Dobbs.) He hence developed and produced a TV Serial retaining the same name “House Of Cards”. The entire TV series was premiered on Netflix (the popular online streaming service) and all the 13 episodes of the first season were made available on Feb 1, 2013. The story of the TV Series is set in the present day and focused mainly on the political incidents took place in Washington D.C. The story moves ahead in a kind of narration way in the beginning. The narration continues throughout but it appears for lesser time on the screen. The narrator of the tale is Frank Underwood (played fantastically by Kevin Spacey) is a Democrat congressman and the protagonist of the series. He dreams high, takes practical decisions, manipulate things, very emotional but buries his feelings inside only, his face doesn’t tell what he is thinking. His character is represented as ambitious fellow who doesn’t hesitate doing bad things when he see greater good. Robin Wright played his equally ambitious, practical and focused wife Claire Underwood who can be ruthless like her husband when needed. Of course there are many more characters come our way and almost all of them are played fantastically by talented actors. And we will discuss about the same in our episode wise reviews. We will take care to not have many spoilers which can steal the joy of thrill when you watch the TV series. Season 1 of the TV series was premiered on at. The success of Season 1 encouraged the makers to go for the next season. The second season takes the story from the point it left in the previous season. Michael Dobbs, the author of the book series – House Of Cards – have served as the executive producer of this (US) Tv series. He is also a distant relative of US author (who wrote non-fictions) of the same name and hence many people confuse between (due to same names, and same profession). Michael himself is a British politician and hence can authentically elaborate some inside stuff. The season 3 for House Of Cards is also planned and announced. A lot of viewers of first 2 seasons are curious to watch it. So are you ready to see it as well? Watch out for the episode wise reviews for the TV serial in coming days. The list of the episodes will keep updated with the links to Episode wise reviews, so don’t forget to bookmark this page.